Inspired by the excitement of March Madness, the dismal performance of my bracket, and of course, the aspect of running a business that we help merchants with every day (getting paid), we decided to work up a little bracket for the methods of getting paid. 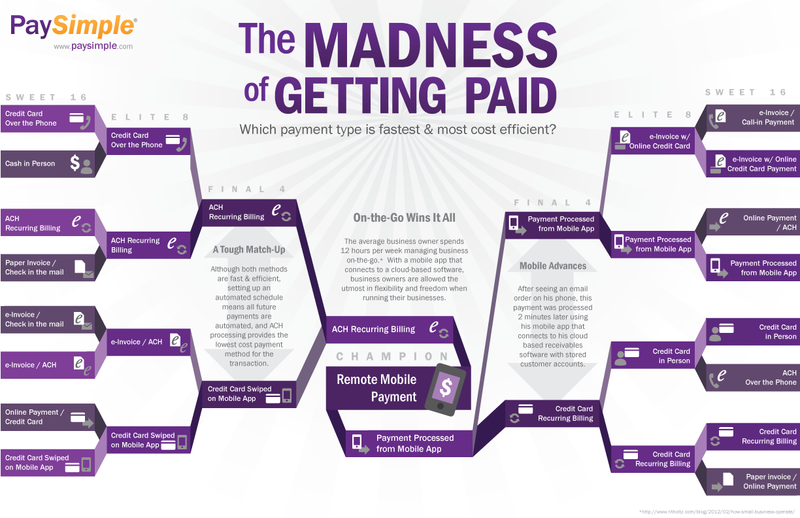 In this infographic, you’ll see methods of payment in head-to-head match-ups. Of course, only the fastest, most flexible, and efficient method for getting paid wins! Click here or click image to enlarge. Infographic designed by Kristi S.
Who doesn’t want to get paid, right? A lot of people are finding more ways to earn money online, instead of just surfing the net for nothing. If you’re a blogger, you’ll tend to get paid through blogging because you’ll earn while having fun.